Explanation: Sometimes, during a total eclipse of the Sun, a strange shadow of darkness can be seen stretching off into the distance. Called a shadow cone, they are visible because the Earth's atmosphere is not completely transparent, scattering sunlight and hence appearing blue during the day. Shadow cones are particularly dramatic for eclipses near the horizon, as geometry creates a long corridor of sun-blocked air. Visible above is a shadow cone caught during a total solar eclipse visible last month from South Australia. The eclipsed Sun itself still appears bright because of light from the surrounding corona. 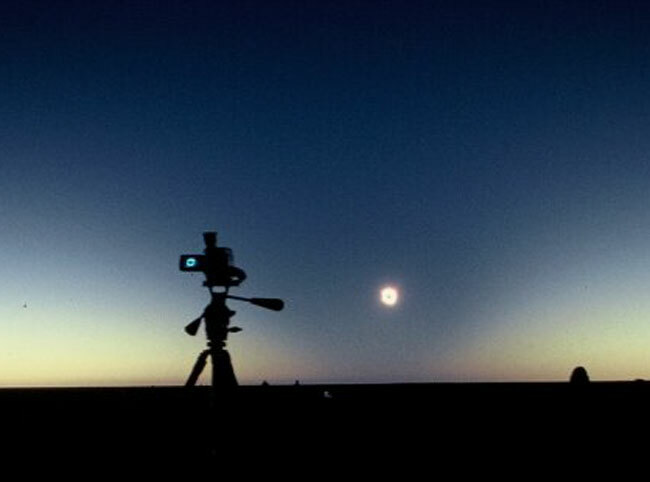 The digital camera on the left is zoomed in to show a better image of the actual eclipse.